The publication of the extensive seven-volume work Comprehensive Molecular Insect Science provided a complete reference encompassing important developments and achievements in modern insect science. 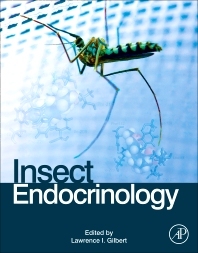 One of the most swiftly moving areas in entomological and comparative research is endocrinology, and this volume, Insect Endocrinology, is designed for those who desire a comprehensive yet concise work on important aspects of this topic. Because this area has moved quickly since the original publication, articles in this new volume are revised, highlighting developments in the related area since its original publication. Insect Endocrinology covers the mechanism of action of insect hormones during growth and metamorphosis as well as the role of insect hormones in reproduction, diapause and the regulation of metabolism. Contents include articles on the juvenile hormones, circadian organization of the endocrine system, ecdysteroid chemistry and biochemistry, as well as new chapters on insulin-like peptides and the peptide hormone Bursicon. This volume will be of great value to senior investigators, graduate students, post-doctoral fellows and advanced undergraduate research students. It can also be used as a reference for graduate courses and seminars on the topic. Chapters will also be valuable to the applied biologist or entomologist, providing the requisite understanding necessary for probing the more applied research areas.